The poetic and artistic theme of an archetypal journey and adventure of life, finds a complementary symbolic concept in the tours and journeys of our everyday "dream visions". 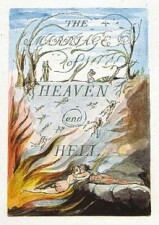 William Blake's "The Marriage of Heaven and Hell" inculcated a literary itinerary and poetic reworking of Dante's "Divine Comedy" and Milton's "Paradice Lost". Both works have dream visions built into them. In our dreams the everyday poetic psychodynamics of the marriage of heaven and hell are at work. Some are able to imagine and realize their dreams, while many others live at the psychological intersection of "The Boulevard of Broken Dreams". The International Institute for Dream Research is dedicated to provide you the reader with what once might have been called the "Grand Tour" of dream vision. Via the literary vehicle of the "1001 Nights in the Global Village" (read article) a guided tour of "visual culture", "the history of dreams", "the rites of passage" and the psychological influence of mass media, popular culture, and the culture industries is envisioned. This grand tour of everyday dream vision will make the dramatic anthropological mise en scene design of the human condition on our planet visible. At the end of 1001 Nights, what you will be able to see and understand, is the epic nature of dream vision and the philosophical synthesis of the oneiric transpersonal process of art and science ("Gesamtkunstwerk"). My dream consisted of one of my old coworkers named Tina and i. We had just had a very quick wedding and moved into a house. The house came furnished and still looked as though someone was living in it. We stumbled upon some baby stuff, a crib, car seat etc. and i asked her what we should do with them since we didn't have a child, she said she didn't know, then i said well maybe now that we are married we could have a child. There was alot of kissing as we were going through the rooms, when we finished going through the house ourselves we were both super excited so we called some people to come take a tour of our new house. After awhile people showed up and we were still so pumped. Than i woke up. Many Americans have lost and still are loosing their house and home due to bank foreclosures. I guess this provides an opportunity for those employed to move in and build their dreams, while others may have to rebuild. Okay well This isn't really about a certain but its what keeps happening. normally when I dream I can't run fast, and I always think I'm gonna get killed and it wont let me run fast it's like in slow motion, but now I can go fast as lightning and everytime I go fast or am moving SO fast I start to up towards the sky, and the whole time it's like I'm half asleep so I feel like I'm in full control of my dream, well kinda, but anyways I just woke up from this one I was like in a wheel barrel and my friend was pushing me then all the sudden he was going SOOO fast and then we just start to go up in the air then everything got completely white and just a light and i can feel my heart and its pounding SO fast like its never been that fast before and I'm half asleep and I'm able to grab my chest by my heart to feel it and its uncontrolably beating. But I've never felt anything like it in the world. I felt like I was entering Heaven. But then I realized what if I am dying and going to heaven right now so i forced myself to wake up. 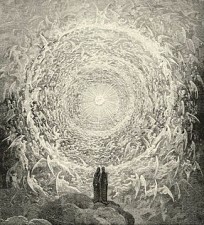 The literary concept of "heaven" is a rather complex, mainly because of all the different ideas that it is composed of. Yours seems to be a vision of a "near death experience" where you see the "light". In her book "Embraced by the Light" Betty Eadie reports about a near death experience. Most dreams I have are fairly down to earth, mainly me searching for something. This past dream was totally different. I woke up in hell, or so it seemed. A place where people with good hearts were still damned. The place looked like an old medieval inn with a red glow and everyone had a gothic appearance (including myself.) The place itself didn't seem bad at all, in fact I enjoyed myself for the time I was there. Looking out the only window in the area where I was at had the actual common vision of hell. The common vision being all the pain, suffering, fire, etc. One aspect of my dream that I didn't quite understand but did at the same time was the fact that I had inherited the devil's son's powers. Every time I tried to think of something that angered me, my hair would turn red and black, my eyes would turn a yellowish orange, my lips would turn orange, and a large amount of heat would rise around me. The last thing I remember is my cell phone that was there, I answered it and it was someone from work and my mother at the same time. That's all I remember of it. This dream vision combines "gothic fiction" with the mythology of "hell". 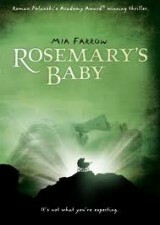 The reference to the devil's son provides a popular culture clue as to which popular "horror reel" the dream is speaking of, namely "Rosemary's Baby". The film uses the plot device of what seems to be a dream and makes it reality. At the end of your dream, you find your cell phone in hell, which is both work and your mother calling. I guess via our dreams we can now take a postmodern cell phone tour of hell! Then comes the wake up call of reality, or was that hell? From a popular music perspective, "What the Hell" (watch music video), happens to be a popular song by Avril Lavigne!